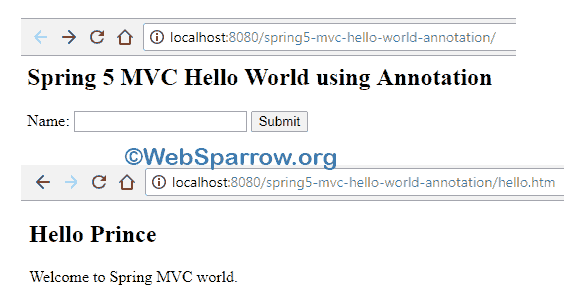 In the previous tutorial, we have created a simple Spring MVC hello world example by using XML configuration. But in this tutorial, we will create the same application using annotation. To do that the Spring framework provides @Controller and @RequestMapping annotation. Annotation reduced the complexity of the application and most of the developer doesn’t like to manage XML files. @Controller: Indicates that an annotated class is a Controller . @RequestMapping: Annotation for mapping web requests onto specific handler classes and/or handler methods. @RequestParam: Annotation which indicates that a method parameter should be bound to a web request parameter. 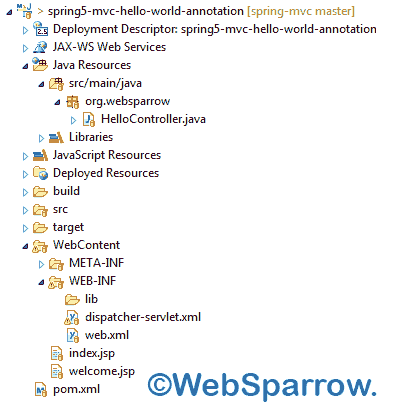 In the next tutorial, we show you how to create Java-based Spring MVC configuration. In this case, we will not create a single XML file. Create a HelloController class and add the @Controller annotation on the top of the class. And to handle the action request create a greet(name) method and add @RequestMapping annotation on the top of the method. We have mapped action request to the controller using annotation so there is no need to map here but we need to tell front controller where is my controller. In this XML file, we only need to scan the packages. Finally, run your application and will get the following result.